Since the IQ of a populace follows the normal distribution [like below], it follows that if plurality is used as the method to implement crowdsourcing, sub-optimal decisions will most likely emerge. This is because the number of votes will be dominated by the votes from individuals of average intelligence level. The number of votes by above-average individuals will not be enough to outnumber the votes by individuals with average intelligence. 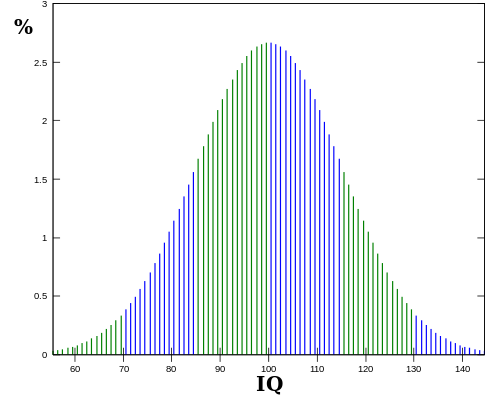 Giving extra weight to votes by individuals with above-average intelligence [using weighted mean] can be explored as a solution to the problem presented above. Any plurality-based result [non-weighted] from a population with a normal distribution [like above] should be interpreted as the choice of the largest number of people, and not necessarily the "best" choice. For example, which stock should we invest in? A plurality-based result should, in my opinion, almost always result in an inferior yield compared to choices made by exceptional individuals.